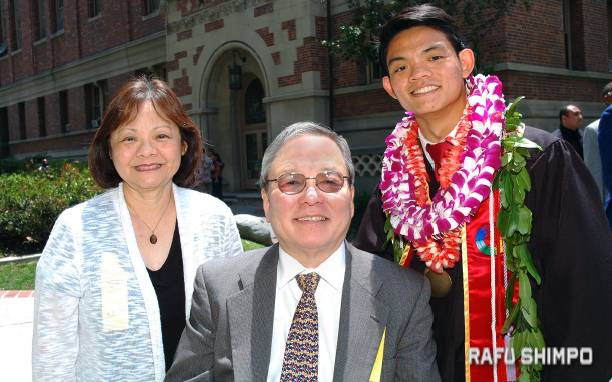 When Jordan Kondo’s name was announced during the May 12 commencement ceremonies at USC’s College of Letters, Arts and Sciences, a soft but proud voice stood out amongst the applause. “Hooray!” was the understated comment from Kondo’s mother. More than a week of gray, overcast mornings had given way to sunshine on this day, adding an extra boost of celebration to what was already a proud day for Amy and Wray Kondo of Nuuanu, Hawaii. Their son was not only graduating from USC; he is the 2017 salutatorian, and leaves with a slew of honors attached to his diploma. Kondo earned his bachelor’s degree in human biology, finishing with a perfect 4.0 grade point average. He received a Fulbright Grant, a four-year Trustee Scholarship, and was named to the prestigious list of USC Renaissance Scholars. A graduate of Honolulu’s Punahou School, Kondo was a straight-A student through high school, as well as a standout on the school wrestling team. He followed the footsteps of his older brother, who graduated from USC in 2014. Kondo said a major challenge was being so far from home, but as fate would have it, his first roommate was a wrestling teammate from Punahou. Kondo credited his parents – both attorneys – saying his success is a direct result of his upbringing, in an environment that encouraged him to stay curious and ask plenty of questions. Eventually, Kondo would like to tackle medical school, but his immediate plan is to spend a year in Okinawa, studying the relationship between diet, genetics and longevity.